San Francisco, CA. When I used to think of sandwiches, I thought of childhood. Bagged lunches containing Hawaiian sweet rolls stuffed with egg salad; briny tuna sandwiches made years before I even knew albacore existed; crispy spam and egg with mayo on soft white my mom would make if we asked nicely. These were the sandwiches I knew, and one of the first things I ever cooked for myself was an artery-clogging monstrosity containing two eggs, two slices of pan-fried spam, and two frozen hashbrown patties, set between two slices of wheat bread. Ike's Place in San Francisco–an unassuming hole-in-the-wall that is actually part of a much-loved NorCal chain preparing to open their first SoCal outpost–transported me back to a time when a sandwich held limitless possibilities, before carbs were vilified. 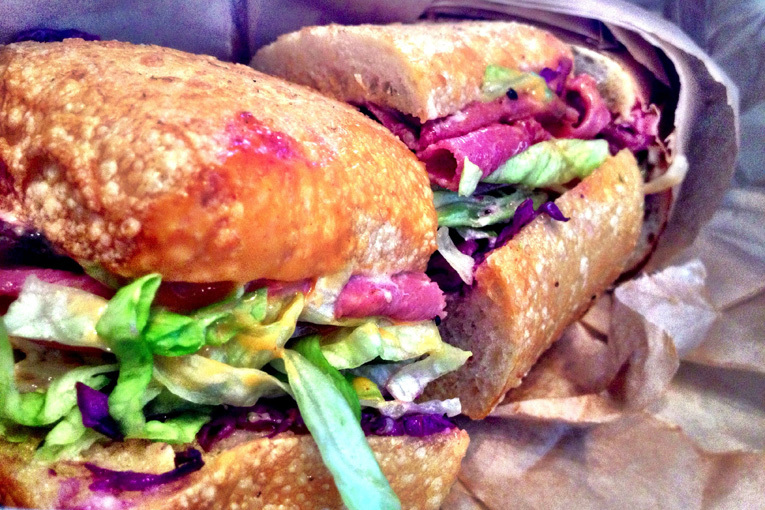 On my last trip to the Bay, #FoodTour: San Francisco I, my two friends and I shared the Paul Reubens, a Subway-shaming pastrami sandwich on Ike's fresh-baked bread piled high with Swiss cheese, house-made poppy slaw, and French dressing, presented with a grace that belies its size. The three of us, hungry after a walk around the Mission neighborhood and Dolores Park, ate in near silence. The bread gave way with a satisfying crunch to a chewy center harboring a burst of flavors; the sweet-sour slaw and dressing countered the salty pastrami perfectly. Even if Ike's doesn't take you back to a specific place and time, with over 80 sandwich options to choose from (including vegan and vegetarian options), one thing's for certain: you will be back. Thanks so much for the post, Jason--I appreciate it. The Paul Reubens is my favorite sandwich. Thanks for taking the comment - We will definitely be trying more in the future!